Home / Blog / Bucheon: a new light shines in the darkness. Bucheon City has a mayor to be proud of! 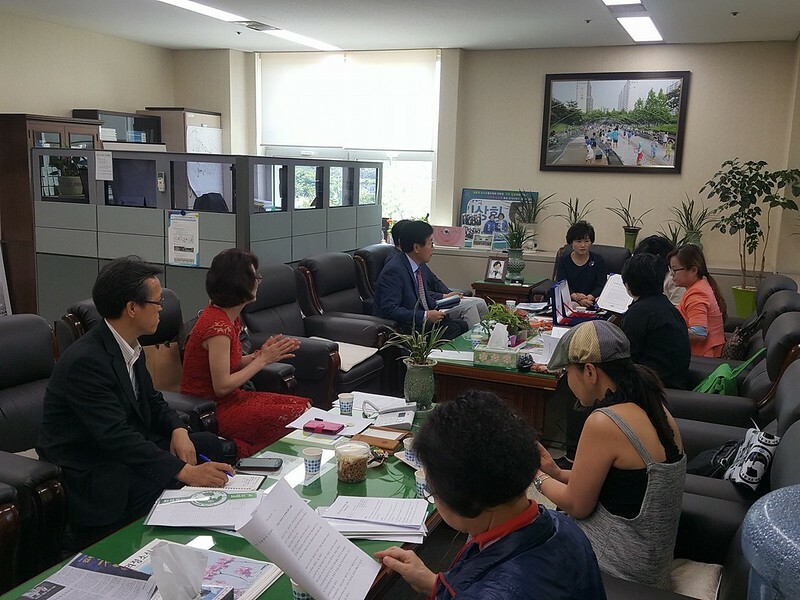 Mayor Man-Soo Kim is actively working towards ending dog meat consumption in his City. 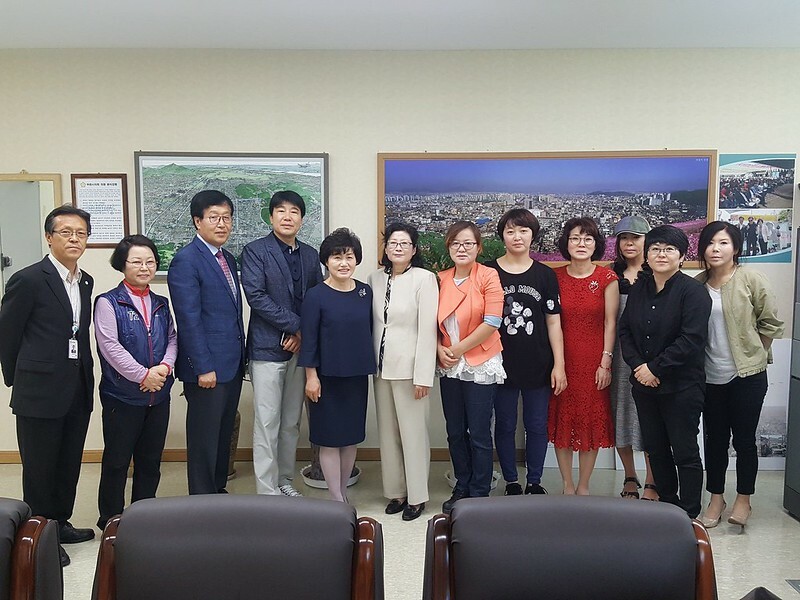 In addition to responding to the approach made by Mayor Harvey Hall, from their Sister City, Bakersfield, who contacted Bucheon – as a direct result of the pressure from our Sister City Campaign – Nami Kim has been talking to, and working together with, various city officials. This is a very important step, as not only are those in charge willing to hear what Nami is saying to them about this ‘unacceptable’ trade, but the city has taken positive steps: passing new animal protection laws, and sending representatives from their offices, and the animal welfare department, out with Nami and her team, to support and coordinate rescue. These are early days, and it is, of course, an uphill climb; but if Bucheon can become an entirely “Dog Meat Free Zone”, this would be a fantastic example to set for all other cities in Korea. We really commend Bucheon on their action, and we applaud all of those within the city offices and other departments who were involved in this positive and inspiring action. Sharing posts from Nami Kim and her team’s Facebook page on May 18 – 19, 2016. 5/19/16 I need to say a word about the sister city campaign and how extremely important it is. 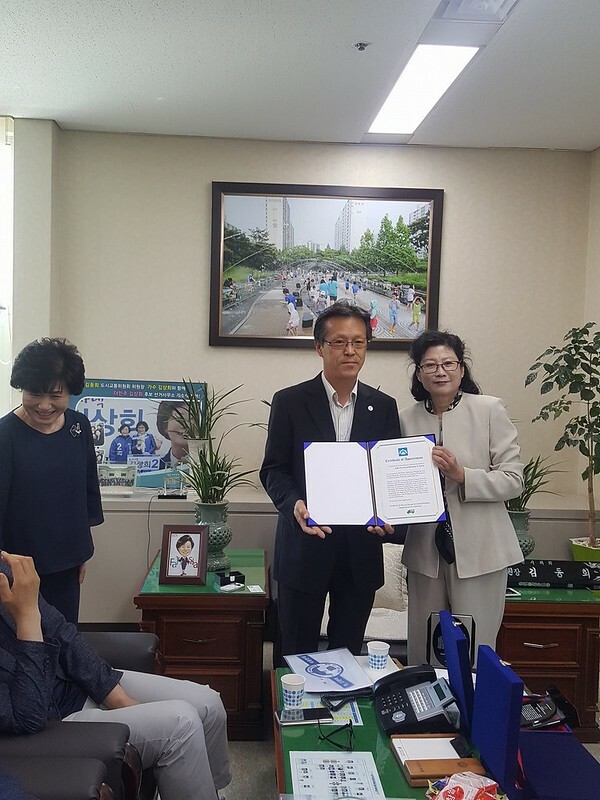 I learned at the meeting with the city of Bucheon yesterday that its sister city Bakersfield’s mayor, Mr. Harvey Hall, did write to the mayor of the city of Bucheon, Mr. Kim, to do something about the dog meat trade in the city. The city of Bucheon does feel shameful about this practice. Koreandogs.org always makes sure the signatures are printed out and sent for all petitions. We have had four victories so far. Let’s keep the momentum going in order to achieve even more victories! 5/19/16 I waited for the day that I was able to meet with all concerned. My desire continues for the city to get involved with relocating some of the dogs from the 300 dogs dog farm. The most we can take at our shelter is 100. What then will happen to the other 200 dogs? The city has no budget for such matters. They don’t even have space for two dogs at the city’s animal shelter. 5/18/16 We all got together to make one voice; the Bucheon city council, the city’s animal welfare department, and our rescue members. The person to the very left is Mr. Kim without his mask. Now the enforcement of the animal law bill has passed but we still have more work to do. We took our first step with hands in hands. 5/18/16 The city councilwoman, Ms. Dong-Hee Kim, is the one who helped get the animal enforcement law bill passed two weeks ago. Today we presented her with a token of appreciation. 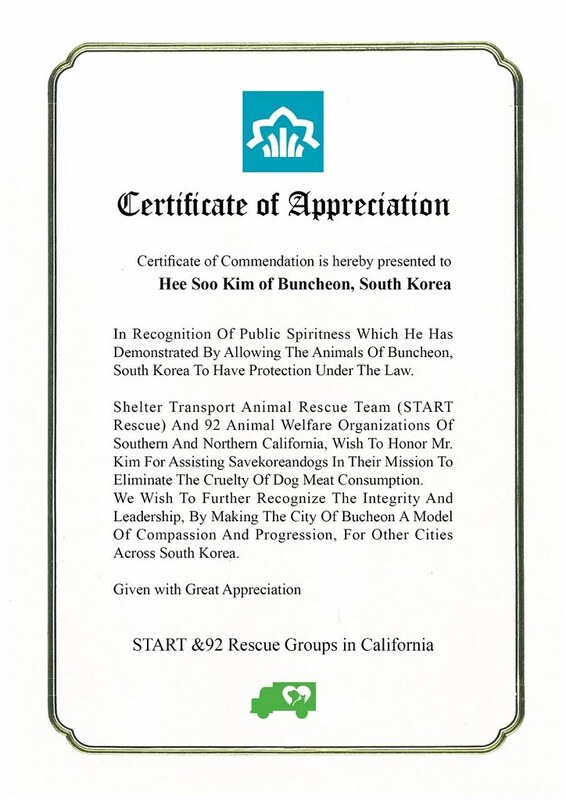 This was made in both English and Korean presented by the START Rescue and 92 rescue groups and animal organizations in California. I urged the city to be the example by becoming a “Dog Meat Free Zone” so that other cities can follow their lead. That will be the next step. It is so wonderful to see someone helping end this barbaric act that has been going on. He is taking such an important step forward. Please, let him be the guiding light that will bring the others out of the darkness. Such terrific news! And, thanks to all of those important people, from the activists, the ones in the trenches fighting every day and night, the ones who donate and those of the Sister Cities and from all around the world. They are very brave. Pulling together, we can only wait for the day that cat/dog consumption and all of the vile treatment and suffering, will finally be put to an end. I admire everyone who is so passionate about this victory and those victories that will be coming. Thankyou for your kindness.Thankyou for listening, and for having a huge heart ❤️ You are an incredible person.Again a million thankyou’s, and all the best to you in all your endeavours . Recently, Nephew’s Fiancée who lost her beloved dog last month, started to volunteer for this place in Los Angeles. The dogs are survivors of the dog meat trade from China, Thailand, Taiwan, Korea…To overcome her grief, she decided to foster a 2 year old pup from S.Korea. Like some of the other survivors, Annie’s back hind leg was hacked by the butcher that had her as a form of torture. For her young age, she’s seen much pain for herself and her cagemates. She’s eerily quiet; you wouldn’t think there’s a dog in the house! Her gazes aren’t deep or inquisitive. She doesn’t want to play, or go outside for a walk, eat or chew. When you pet her, she doesn’t display the feedback one is accustomed from a happy dog! She just wants to be still~ enveloped in her bed and blanket. The man who travels to China, Korea and other S.E. Asian countries to rescue dogs and cats is Marc Ching. His organization is http://www.animalhopeandwellness.org. He also works with Soi Dog foundation. I’m really saddened that China’s Yulin festival is right around the corner. After that, S. Korea has their 3 month long festival. Even though I’m vegan, I don’t expect everyone to choose my way of eating, but when animals are tortured in such horrific way of being torched, batted, electrocuted, boiled alive, and out in the open, it makes me lose my faith in humanity ~ even though there are many good humans out there. The sad part is that good humans are outnumbered by subhumans! My problem is not even why these countries eat dog, cat or any kind of meat! My problem is that they want to torture the animal so much before consumption so the adrenaline would make the meat taste better! I pray to see this culture of cruelty based on asinine traditions to be abolished! I cant believe that humans can torture to these inocents animals, that are done nothing wrong, for them to suffer that way. Please, koreans is enought if that barbarie! Please have compasion for them! I totally agree with everything that Roya has said. I believe that no living creature, human or animal should suffer torture and thank anyone who tries to stop it. People need to be made to understand that meat doesn’t taste better when the animal (any animal ) dies in pain !!! Thank god there are some good people in korea who want to end this horrific torture and cruel confinement of innocent animals when I think what goes on in the slaughter houses and markets it breaks my heart. Let’s hope this is the beginning of the end to dog and cat meat trade and that other cities follow in the right steps. Thank you to all you amazing people that are fighting to stop the cruelty. A MILLION BLESSINGS on you all for your brave fight for these helpless dogs and cats. I am one of thousands of people all over the world who lie awake nights over this horrific issue. Sometimes the only way I can fall asleep is the knowledge that truly courageous opponents of these criminals like Nami Kim are there and TAKING ACTION. THANK YOU!!!! Nami Kim is a HERO as is Marc Ching. We need to continue to sign petitions and EMBARRASS the Korean, Chinese, Cambodian and other asian countries until this disgusting and barbaric act, ENDS. This is good news, but think it’s still a long way off before other cities and countries follow in regards to banning dog meat. So many more dogs and cats will suffer a horrible fate before then. No words can describe how upsetting it is seeing pictures of dogs being tortured before they are killed. How can this be allowed to continue in the 21st Century!! I for one, will never stop helping to end this cruel, medieval trade. Congrats, Nami!!! You are a hero! Congratulations to our wonderful Nami Kim – your strength and conviction is amazing! A zillion thank yous to Mayor Man-Soo Kim who is leading the way in getting this terrible ‘trade’ banished in his city. Buncheon City you will become famous across the world as being the first city in South Korea to become dog meat free and other cities will follow your lead! This is our dream – please make it happen so no more dogs and cats die in such horrific unspeakable torture…. You’re one of the most awesome people in the world, ever, Nami Kim, and your associates and supporters are also amazing. Bless you always for what you’re doing. ABOUT DAMN TIME!!! I believe the dog meat trade is the most barbaric thing any human can do. I give u guys props for taking a step to this HUGE industry. Lets STOP THIS FOR ONCE ABD FOR ALL!! You are indeed a light shining in the darkness, Nami Kim. Many blessings to you and your staff! ME SIENTO MUY ORGULLOSA DE NAMI KIM Y DE SER PARTE DE KOREANDOGS ORG. !!!!! congratulaciones Nami Kim !!!!!! yo te amo !!!!! WRITE TO GOVERNMENTS ALL AROUND THE WORLD TO ASK STOP ! JUSTICE FOR ANIMALS !! DO IT NOW !